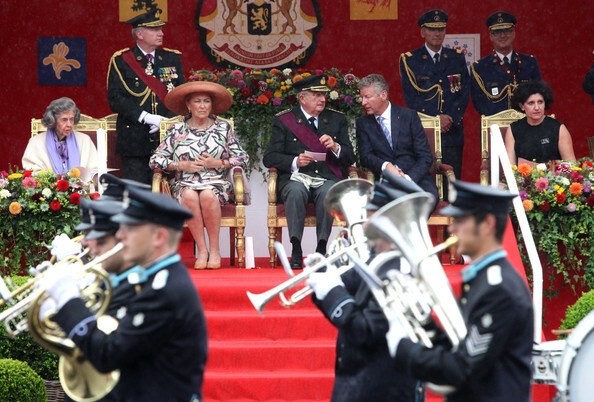 The President of India, Shri Pranab Mukherjee has extended his greetings and felicitations to the King and people of Belgium on the eve of their National Day (July 21, 2015). In his message to His Majesty King Philippe, The King of the Belgians, the President has said, “On behalf of the Government, the people of India and on my own behalf, I extend my warm greetings and felicitations to Your Majesty and to the people of Belgium on the occasion of your National Day. In recent years, our enduring cordial and friendly relationship – based on shared democratic values, has witnessed significant expansion. I am confident that we will continue to consolidate and strengthen this multi-faceted relationship to the mutual benefit of the peoples of our countries. Indigenous Visibility Measuring System - Drishti Installed at Indira Gandhi International Airport, New Delhi for Supporting Safe Airport Operations. Sophisticated instruments, indigenously designed and developed by CSIR-National Aerospace Laboratories (CSIR-NAL), Bengaluru called as - DRISHTI, have now been made fully operational at the Indira Gandhi International Airport, New Delhi. They are used for reporting the runway visual range, which is a critical parameter for safe landing and take-off of aircraft in poor visibility conditions (<25 to >2000 meters). Drishti Transmissometers have been installed at this airport recently, as a part of the first phase installation of 20 such systems in 10 airports across the country. Earlier, a milestone was achieved in the field of aviation safety, when CSIR-NAL and India Meteorological Department (IMD) signed a partnership agreement to jointly execute a mega project for installation of nearly 70 Drishti systems, at various Airports of the country. The Drishti field site system is completely designed and fabricated at CSIR-NAL. IMD has established the dual mode “Landline” and “Wi-Fi” communication along with multiple displays at Air Traffic Control Room and Approach Radar Room. The development of ‘Drishti Integrated Visibility Software’ by CSIR-NAL, wherein the data from all the Drishti systems of all the runways of IGI Airport can be viewed on a single screen at ATC has eased out computer and instruments congestion at ATC and would aid the MET officer to easily report visibility data to pilots. The Drishti system is very cost-effective and is a mandatory system required at all airports as per International Civil Aviation Organisation (ICAO) and World Meteorological Organisation (WMO). The complete system is engineered in such a way to enable easy installation and maintenance. Another advantage of this indigenous system is that CSIR-NAL can do the health monitoring of the system through web enabling from Bengaluru itself. This drastically reduces the cost of maintenance, which is exorbitant in case of imported systems. Prime Minister Shri Narendra Modi has said that collective efforts are required to find solutions to issues like the Land Bill and to enable effective functioning of the Parliament. Addressing the Meeting of Leaders of all Parties and Groups in both the Houses of Parliament convened today ahead of the Monsoon session of Parliament beginning tomorrow, Shri Modi endorsed the views expressed by Shri Ramgopal Yadav of Samajvadi Party in the matter. Prime Minister further said that “Let every issue be discussed in the Parliament under the Rules. Efforts shall be towards effective functioning of Parliament. During the last Session, it was decided that some issues would be addressed during the next Session. Of all the forums available for expression of one’s views, Parliament is the best. Let there be good debates and suggestions. Like Ramgopalji said, we need to find solutions collectively. Yes, Government has more responsibility in enabling normal functioning of Parliament but so does all of you”. Minister of Parliamentary Affairs Minister Shri M.Venkaiah Naidu who convened the All Party Meet, in his opening remarks expressed concern over the media reports that the ensuing Monsoon session would be a washout and hoped that those reports won’t come true. He said that “Government has no problem to discuss every issue and any issue anytime. There is no substitute for healthy debate in Parliamentary democracy. It needs serious consideration if matters related to States are to be taken up in Parliament.” The Minister gave details of the Bills being proposed by the Government for introduction as well as for consideration and passing during the Monsoon session beginning tomorrow. Shri Naidu also informed the Leaders that Government would like to make Statements on the visit of Prime Minister to the Central Asian Countries and also about some of the major initiatives taken by the Government. Later speaking to the media, Shri Naidu informed that External Affairs Minister Smt. Sushma Swaraj was keen to make a Statement in respect of the allegations made against her regarding Lalit Modi’s travel documents. Shri Naidu ruled out resignations as being demanded by the Congress. Shri Ghulam Nabi Azad of Congress said that developments relating to VYAPAM and Lalit Modi were serious developments and the Government should take action in this regard. He also demanded the resignation of the concerned. Other leaders while noting that these developments reflected ‘systemic degeneration’ preferred detailed discussion. Shri Ramgopal Yadav of Samajvadi Party suggested collective efforts of the Government and the opposition to find a solution to the Land Bill issue by adopting a give and take approach. 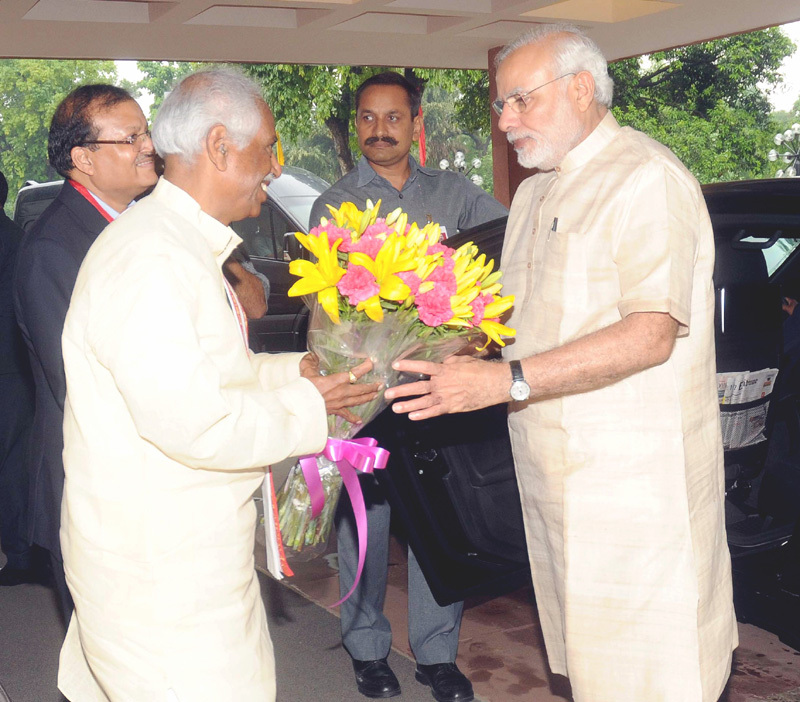 He preferred efforts to enable smooth functioning of Parliament. Other issues suggested for discussion by various leaders during the two hour long meeting included : India-Pakistan relations and Foreign Policy, growing social disparities, Farmers’ suicides and farm sector distress, issues relating to Andhra Pradesh Reorganisation Act and their implementation, Reservation for SCs and STs in promotiions, problems of tobacco farmers, Socio-Economic and Caste Census, Relations between Lt.Governor and Delhi Government, Preparedness for 2016 Olympics, MPLADS scheme, Higher Education sector issues, Issues relating to North –Eastern Region, Climate Change, issues relating to production of natural rubber, Celebration of 125th Birth Anniversary of Dr.BR Ambedkar, Ensuring adequate representation for SCs/STs on the Boards of PSUs. A total of 42 leaders from 29 Parties represented in both the Houses of Parliament attended the two hour long meeting to discuss the agenda for the Monsoon session of Parliament beginning tomorrow i.e July 21, 2015. The Prime Minister, Shri Narendra Modi being received by the Minister of State for Labour and Employment (Independent Charge), Shri Bandaru Dattatreya, on his arrival for the 46th Indian Labour Conference, in New Delhi on July 20, 2015. 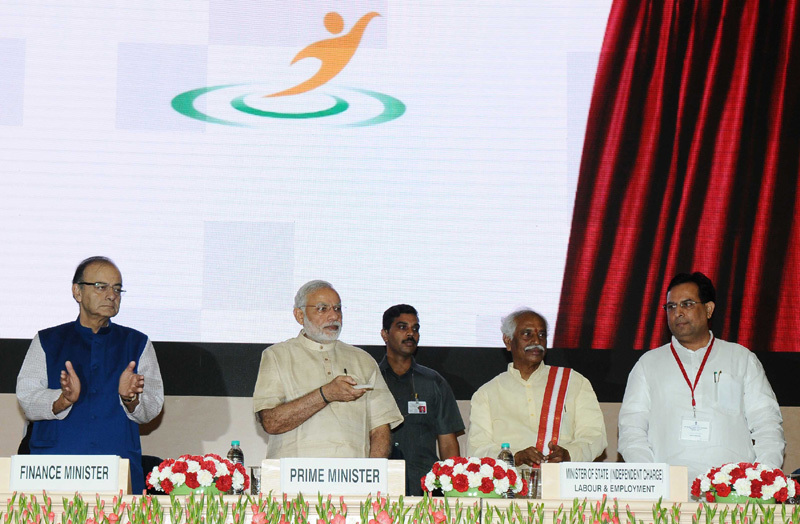 The Secretary, Ministry of Labour and Employment, Shri Shankar Aggarwal is also seen. 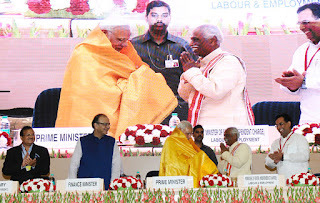 The Prime Minister, Shri Narendra Modi being welcomed by the Minister of State for Labour and Employment (Independent Charge), Shri Bandaru Dattatreya, at the inaugural ceremony of the 46th session of Indian Labour Conference, in New Delhi on July 20, 2015. 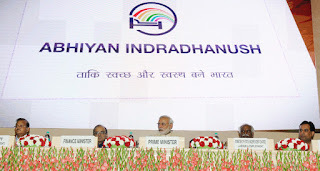 The Union Minister for Finance, Corporate Affairs and Information & Broadcasting, Shri Arun Jaitley and the Secretary, Ministry of Labour and Employment, Shri Shankar Aggarwal are also seen. 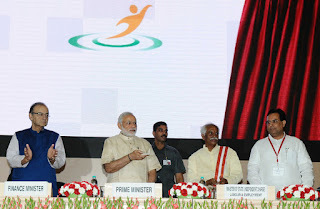 The Prime Minister, Shri Narendra Modi dedicating the National Career Service Portal to the nation, at the 46th session of Indian Labour Conference, in New Delhi on July 20, 2015. The Union Minister for Finance, Corporate Affairs and Information & Broadcasting, Shri Arun Jaitley, the Minister of State for Labour and Employment (Independent Charge), Shri Bandaru Dattatreya, the Secretary, Ministry of Labour and Employment, Shri Shankar Aggarwal and other dignitaries are also seen.